A few weeks ago (the 18th of March), on a beautiful early spring afternoon, I went into Bute Park in the centre of Cardiff to take some photographs of spring flowers. Here are the results. 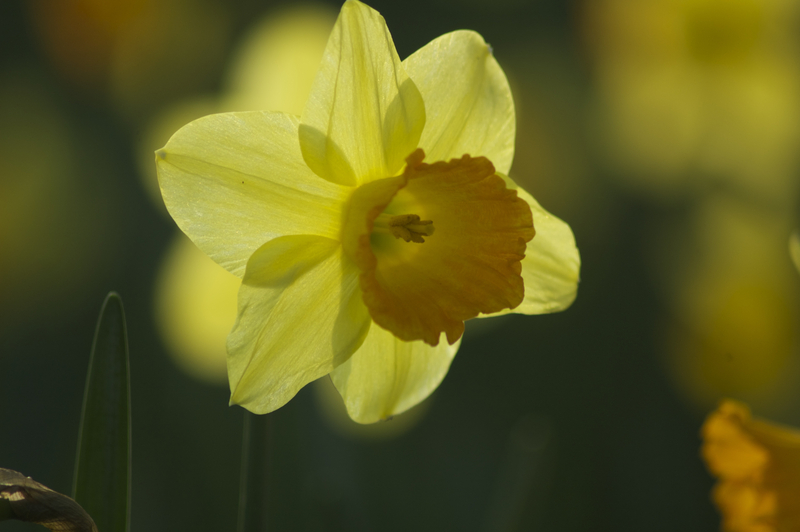 A backlit daffodil in Bute Park, Cardiff taken on the 18th of March 2014. For those of you interested, I took all the photographs using a Tamron 70-300mm macro lens on my Nikon D70 DSLR, which is now nearly ten years old but works fine and produces high quality images. I took all the photographs in RAW mode, using the aperture priority mode, allowing the camera to use its autofocus. Most photographs were taken with the aperture wide open (which is about f/4 to f/5.6 depending on the zoom of the lens), as it was late afternoon and the light was getting weak. But, for some of the photographs, I stopped down the aperture to increase the depth of field. I have always loved waterfalls. I’ve been lucky enough to see Niagra Falls twice. The first time was in winter, February 1993 to be precise. Niagra Falls in February was quite a sight to see. Most of the water was frozen, and it was so cold on the day I saw them that I could barely stand outside to look at them. Thankfully there was an inside observation platform, so I retreated to there to look at them without my eyes stinging from the cold. I saw them again some 18 months later in the height of summer, a very different sight. One day I hope to see Victoria Falls (as the Europeans named it), or “Tokaleya Tongazen” as the locals call it; which is on the border between Zimbabwe and Zambia. I stumbled across a web page about these particular waterfalls in Guyana recently, so decided to blog about them. The falls are called Kaieteur Falls, and they’re often referred to as the largest single drop waterfall in the World. 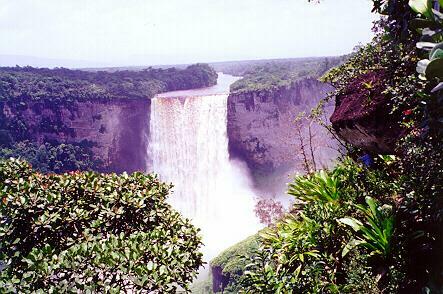 Kaieteur Falls in Guyana, South America. 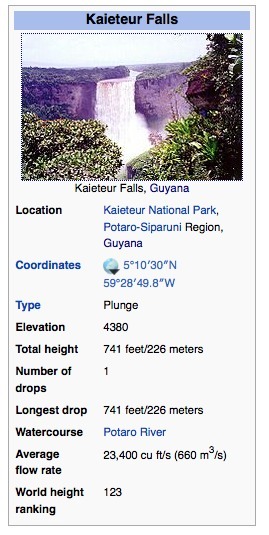 Some facts about Kaietuer falls in Guyana. I guess it says something about the strange way my brain works, but when I saw the phrase “single drop” I interpreted it as a single drop of water (as in a water drop)!!! Doh! What it in fact means is that the volume of water which falls before the first break in its fall is the largest volume of water of any waterfall in the World. Although it is not the largest height of any waterfall, at 226 metres it is still pretty high. But when one factors in the volume of water going over the edge each second, the volume in this 226 metre “sheet” of water is the largest of any waterfall in the World. 663 cubic metres of water go over the edge each second, so how would we work out the volume of water in the 226 metre height? The “single drop” volume? I will leave you to think about it, and I post the answer next week, unless someone gets it right in the comments section below. 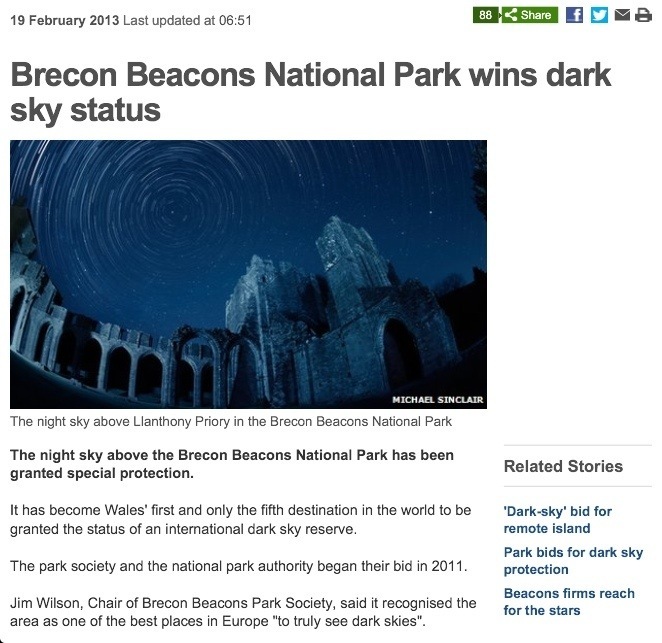 This morning (Tuesday 19th of February) I heard this item on the news about how the Brecon Beacons National Park in South Wales had been granted dark sky status by the International Dark Sky Association. This is wonderful news for Wales. Earlier I had a phone call from the BBC asking me to talk about this on this evening’s news. They are planning to film the item live up in the Brecon Beacons. In the next couple of days I will try and do a video capture of the item and post it on YouTube. I first got involved in light pollution work in 1998. I remember it distinctly, because it was the same week my 2nd child was born. 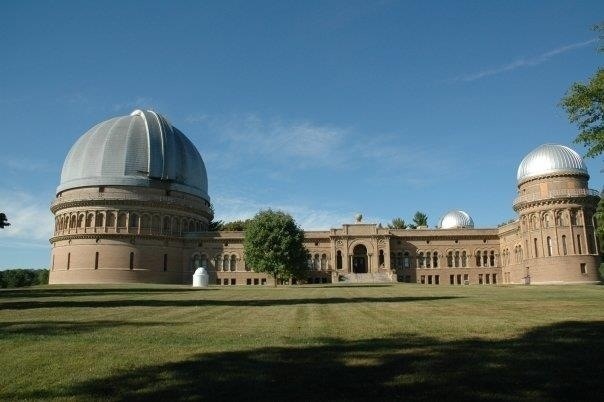 At the time I was working at the World famous Yerkes Observatory, part of the University of Chicago. Yerkes houses the World’s largest lens telescope, the great 40-inch refractor and is where many famous astronomers, including Edwin Hubble, have worked. I was lucky enough to work there for 6 years as a post-doctoral researcher, and I used to try to use the Observatory’s 41-inch (1-metre) reflecting telesocpe for some of my research. I started using the 41-inch in 1997, but by 1998 it became obvious to me that my images were not as good as they should be, and so I started investigating the darkness of the skies at the Observatory. I took a series of horizon photographs from the catwalk of the 40-inch, and the results surprised me. Yerkes Observatory is about 75 miles North North-West of Chicago, so I fully expected the direction to the South South-East to be the brightest part of the horizon. But in fact it was not, the brightest parts were to the East (the city of Lake Geneva) and to the North-West (the city of Delavan), both within about 7-8 miles of the Observatory. I knew there was little I could do to influence the light pollution coming from Chicago, but discovering that the main problem was local gave me hope. I consulted with the numerous pages at the IDA website, and drew up a lighting ordinance. I first gave a presentation about the problem to the Village Board of Wiliams Bay, where Yerkes is based. Not surprisingly, with the over 100-year old Observatory in their community, they were very supportive and agreed to adopt the lighting ordinance. I then took it to the other communities, Delavan, Lake Geneva and Elkhorn. The major light polluter was a greyhound racing track about 6 miles North-West of the Observatory on the outskirts of Delavan. On one occasion the greyhound track’s light pollution prevented a potentially important discovery. In the period 1998-2002 a hot area of research was determining the nature of gamma ray bursts (GRBs). At the time, the satellite which would discover these in the X-ray, a satellite called BeppoSAX, didn’t have enough positional precision to know exactly which object had caused the burst. So it was important to try to find the optical counterpart, something the 41-inch was ideal for as it was under-utilised and so usually available at short notice. One particular GRB in 1999 would have been visible to us at Yerkes, but as bad luck would have it, it was in the direction of the greyhound track, a part of the sky where the light pollution rendered seeing it impossible. I arranged a meeting with the manager of the greyhound track to discuss this problem. By this time I had got a light meter via a grant from the American Astronomical Society small grants program, to investigate light pollution levels in the locality. I measured the lighting levels of the metal halide lights the greyhound track had on in its car park all night every night (even though it was only open for races on a Friday and Saturday evening!). They were 10 times (yes, ten times) the level recommended by the IDA and the American Society of Lighting Engineers for a car park of its size. They were even above the level recommended for reading in one’s house!! Even though the car park was tarmac (“black top” as Americans would call it), reflecting maybe 10% of the light from this black surface was leading to a huge dome of light above the area. On the nights when there were races the problem was even worse, as the track itself would have bright stadium lights on too. I calculated the amount of money the track was wasting by having these lights on all night, and it was in the tens of thousands of dollars per year. Given that the track was making a loss, I thought this might be the best argument to use with the manager. I didn’t think he would particulary care about whether we could or couldn’t see the afterglow of a GRB, but I was sure he would be concered to know that he was wasting so much money. By the time I left Yerkes Observatory in 2001 most of the communities had adopted the lighting ordinance. The only one which hadn’t was, unfortunately, Delavan. I moved back to Wales in 2001, to the Cardiff area. Of course Cardiff is far more urban that where I had been in Williams Bay, Wisconsin. So initially I thought doing something about light pollution back here was a lost cause. But then I realised that there were areas near Cardiff, like the Brecon Beacons and Pembrokeshire (where I grew up) which were still dark. It was growing up with the dark skies in Pembrokeshire which allowed me as a child to indulge my passion for astronomy and see the stars properly. I think it was in about 2003 or 2004 that I was first invited to give a talk to an astronomical society based in Mynachlog Ddu in Pembrokeshire. This is one of the darkest places in the Disunited Kingdom. It was darker than the skies I had lived with at Yerkes. Another extremely dark place is, of course, the Brecon Beacons, only an hour north of Cardiff. In about 2006 I wrote to Rhodri Morgan, the then First Minister of Wales, about light pollution and how Wales could profit from some naturally dark skies by preserving and promoting them. 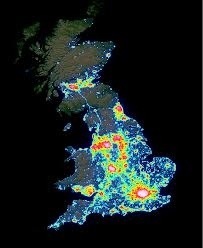 Some 90% of the population of the Disunited Kingdom live in areas where there is substantial light pollution. This means they do not get to see the sky in all its glory. But, of these 90% many thousands are interested in the sky. They are members of astronomical clubs, but struggle to see what they are interested in. The Brecon Beacons will now be able to attract these kinds of people, so called dark sky tourism is a growing area and one which Wales can capitalise on. The night time sky is part of our shared heritage, and connects us with our ancestors thousands of years ago. It is where myths and legends have been played out by our great story tellers. Each civilisation has its own stories about the pattern of stars we see in the sky. But in the last 50 or so years so much of this shared heritage has disappeared from view due to bad lighting. Hopefully we are slowly beginning to do something about it. 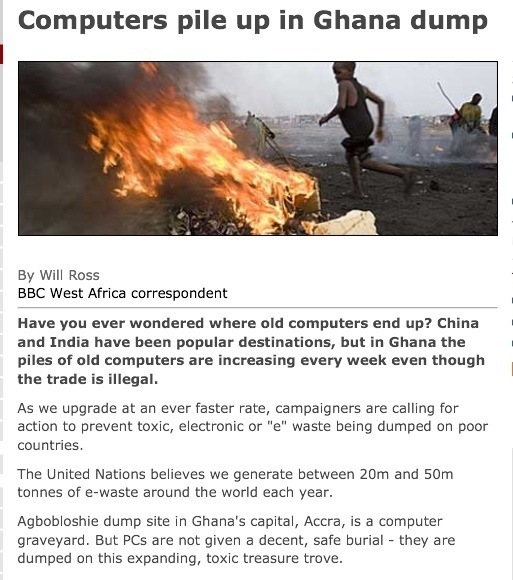 I was reading a story recently about how The European Union was going to take more stringent action on the shipping of so-called “e-waste” (computers and other electronic goods) to Ghana. Ghana has become the place for computers from Europe to get dumped. When you take your computer to the recycling centre you think you are doing the right thing environmentally. You cannot just dump a computer in a landfill in Europe or the USA (or most other developed countries). So, you take it to the recycling centre. Rather than recycle the computer, back in the mid 1990s it was decided to ship these old computers to African countries, where poorer people could get to use a computer that would cost one tenth or less of the price of a new one. It seemed to be a win-win situation, it was cheaper to ship the computers than recycle them in the developed countries, and it was felt that developed countries were doing their bit to bridge the “digital divide” by giving the computers to developing countries. But, sadly, over the years the business became corrupted, and by early in the 2000s the computers were not being used by the people in the developing countries at all, they were being dumped in landfill sites there. Today in Europe, millions of computes that are taken for “recycling” are instead ending up in toxic landfill sites like the one in Agbogbloshie in Accra, the capital city of Ghana. There are many articles on this problem to be found on the web, but one of the best is this one from Time Magazine. At these sites, thousands of people scavange for precious metals from the computers, burning away the plastic insulation to retrieve the metals. This leads to palls of acrid and toxic smoke rising into the sky near these dumps. Photographs and news clips that I have seen of Agbogbloshie suggest it is a living hell. Measurements suggest that levels of toxic chemicals are at least 100 times the allowable limits set by the World Health Organisation (WHO). So next time you take your computer or TV or other electronic device to your local recycling centre, try to find out before you do whether your local authority ships it out to Ghana or some other toxic landfill site rather than doing the proper thing and recycling it properly in an environmentally friendly way. A few weeks ago, as I metioned in a previous blog, I was on a panel discussing the science fiction film Silent Running. Also on the panel was Dr. Rob Thomas of Cardiff University’s School of Biosciences. Rob has kindly given me permission to reproduce here his comments on some of the issues raised in the film. The world is changing, and has already changed. Global temperatures are rising, weather patterns are altering and evidence for these changes being driven by human changes to the composition of the Earth’s atmosphere has (in the view of most mainstream scientists) become compelling. It is now also becoming clear that the rapid changes to the climate over recent decades have been associated with major changes to the Earth’s ecosystems, species and individual organisms. For example, research at Cardiff School of Biosciences is mapping many of these changes, including case studies as diverse as the impacts of climate change on long-distance migratory birds, disease transmission, interspecific interactions and the structure of ecological communities in rivers, soil and tropical forests. Of course, climate change is not the only ecological issue; the combination of climate change with other human impacts on the environment, such as habitat destruction, pollution and unsustainable harvesting of wildlife (e.g. overfishing) has been described as a “deadly anthropogenic cocktail” which threatens the long-term viability of Earth’s ecosystems. The film “Silent Running” is based on the premise that the Earth has already suffered an extreme environmental catastrophe, leading to Earth’s few remaining fragments of forest vegetation being evacuated to a spaceship for safekeeping. This apocalyptic scenario is of course deliberately extreme for cinematic effect, to get us thinking how we would behave in such an unprecedented situation. Yet there is a sense in which we can see Planet Earth itself as a relatively small and vulnerable “spaceship” travelling through the universe, whose fragile and precious ecosystems are the only ones we have left. Indeed, this is one of the great insights obtained by the first astronauts looking down on our home planet from space, seeing Earth for the first time as a tiny yet precious habitable outpost in the vastness of space. The question is; what on Earth can we do to protect it and ensure the survival of its biodiversity, including humanity? Environmental protection is not straightforward -it is clear that human societies, governments and nation-states consistently fail to act for the good of the planet. Examples of ecologically harmful political and economic structures are innumerable; the Common Fisheries Policy, the Common Agricultural Policy, the abortive Copenhagan climate summit are just a few recent examples, but major human impacts on the environment can be traced back into deep pre-history. These much older examples include the extinctions of native megafauna that coincided with the arrival and spread of humans in Australia and the Americas; the complete deforestation of Polynesian Islands, and the unwitting or deliberate introduction of rats, pigs, goats and rabbits to fragile island ecosystems across the globe. Case studies of this deadly anthropogenic cocktail of climate change and other human impacts should alarm us; not just because they show us that the biological word is indeed changing rapidly, but because they also highlight how little we currently know about the underlying mechanisms by which climate influences ecosystems, or what we could do to minimise -or even just predict- these ecological impacts. For example, we can describe how ecosystems have responded to climate variability within the historic range, but this does not necessarily let us predict how ecosystems would respond to more substantial climate change in the future. This is because responses of individual species may be non-linear, or community composition and ecosystem function may alter as individual species become extinct. Any or all of these are possibilities, or other, as yet unknown, effects may become apparent; so much is unknown that ecological prediction beyond the recent range of climate conditions remains largely guesswork. Climate models indicate that even if emissions of greenhouse gases stabilised immediately, the increases in the insulating properties of the atmosphere that have already occurred have committed us to a substantial amount of future warming. Since it is clear that climate change leads to ecological change, substantial ecological changes appear inevitable too. It seems that rather than hoping to prevent climate change, we can only hope to minimise warming as far as reductions in emissions can allow. This means that we need to be pragmatic and focus on how to manage ecological change, for the inherent value of the ecosystems themselves, as well as for the long-term benefit of humanity. Suggested solutions to the environmental crisis includes “technological fixes” for specific problems, such as “carbon-free” energy from technologies such as nuclear fusion, or by seeding the oceans with iron filings to induce phytoplankton blooms that would act as carbon “sinks”. However, our pragmatism needs to encompass the distinct possibility that humans will accidentally fail to develop workable technologies to achieve these “fixes”, or develop them too late to prevent ecosystem collapse. This pragmatism also requires a frank appreciation of how human societies, as well as individual humans, behave; our motives as well as our constraints and limitations. For example, we humans are not good at evaluating long-term risk, and we tend to favour our own self-interest, especially over the interests of people we do not know. Similarly, our political structures influence the means by which change is –or is not- possible; governments take a short-term view because they need to be re-elected every 4-5 years, politicians are answerable to their local constituents, or at least to their own nation-state, rather than the global community. Ecologists and conservationists need to acknowledge these human realities (frailties?!) if we are to see meaningful protection of the environment. It is not enough to sigh and wish that humans would be more altruistic –we need to examine the circumstances in which humans have incentives to behave altruistically. The type of incentive may vary; money certainly motivates governments, so our arguments need to be economic as well as moral. Family ties certainly motivate individuals, so our arguments need to encompass our environmental legacy to our own children and grandchildren as well as to the human family as a whole. The future for Spaceship Earth is uncertain. It does have a future of course, but whether that future includes a healthy environment for humans and for the current diversity of other species, is now largely up to our own generation –in other words, you and me. The responsibility is mind-boggling, and tempting to deny, but there seems no more important issue that the scientific community can address. And despite everything that I have written above, I believe there is room for optimism. Nature is, by very definition, adaptable. And in that sense, nature is resilient. So too is humanity, whose human frailties go hand in hand with traits such as intelligence, morality, and the ability to plan strategically for the future. Climate change may well precipitate the greatest ecological, societal and moral challenges that our species has faced, yet the scientific challenges that lie ahead are exciting, vital and I for one want to be involved! Last night I was part of a panel of 4 people discussing various aspects of the 1972 Sci-fi film “Silent Running“. This event was organised by BRASS, the Cardiff University centre for Business Relationships, Accountability, Sustainability and Society. It was run as part of Cardiff University’s sustainability week. The other participants were Dr. Chris North (also of the School of Physics and Astronomy in Cardiff University), Dr. Rob Thomas of Cardiff University’s School of Biosciences, and Chris Barber, founder and head of the International Space School Education Trust (ISSET). The film’s plot is that a fleet of space ships have left Earth, which has become uninhabitable to plant life. The space ships are out by Saturn, having left the Earth carrying enormous geodesic domes carrying plant life and animals. The film focuses on one ship in particular, Valley Forge (which, historically, is a site in Pennsylvania near the Delaware river where George Washington regrouped in 1777-78 in the war of independence against Great Britain). The film’s main character is Freeman Lowell (a combination of Freeman Dyson and Percival Lowell perhaps?). He tends to the plants and animals in these geodesic domes (or “forests” as they are referred to in the film), so when he and his fellow crew members are ordered to jettison the forests and return to spaceship to commercial use, he is horrified and decides to rebel against the orders. After the film, the 4 panel members, our moderator Lorraine Frater of BRASS and the film’s audience went to a separate room to begin the discussion. I was, unfortunately, the first to say my piece. Given one of the themes of the film, I decided to talk about terra-forming. As you can see from these slides, I started off by trying to put human beings’ brief history on Earth into context. In slide 2 I show a graphic to get this idea across. If one were to compress the 4.6 billion year history of Earth into just 24 hours, then human beings only make an appearance in the last 20 seconds on this timescale! What many people don’t realise is that, for most of the history of the Earth, the planet would have been uninhabitable to humans. Green plant life didn’t start oxygenating the atmosphere until roughly 1.5 billion years ago. However, human beings have evolved to live in the conditions which now exist, and so if we have to abandon our planet, we would need to be able to create an environment elsewhere which is able to support our needs. This is the idea of terra-forming. We may, of course, make the Earth uninhabitable to our species through our own folly, but eventually the Earth will become uninhabitable to all life when the Sun swells up to become a red giant. This is not going to happen for about another 4.5 billion years, so a whole 24 hours more on our compressed timescale. Given that we have only been around for 20 seconds on this scale, it is maybe a little naive to think we will survive much longer than a few tens of seconds more, or a few minutes at most. Nevertheless, NASA and other space agencies have held workshops on terra-forming, with Mars being the most likely candidate. The gravity of Mars is similar, the temperature is not too different, so compared to most other locations in the Solar System it is the best candidate for terra-forming. However, currently the atmosphere of Mars is some 96% CO2, with most of the remainder being Nitrogen. There is no oxygen to speak of in the atmosphere, whereas the 20% oxygen in our atmosphere is essential for most multi-cellular life. In order to oxygenate either the entire atmosphere of Mars, or even some geodesic domes on its surface, we would need green plant life to use photosynthesis to do the work for us. Personally, I don’t think there are no aspects of terra-forming which are beyond our understanding, but much of it is beyond our present technology, or beyond the money governments would be willing to spend. In my opinion, it would be very stupid to invest money on terra-forming at the expense of fixing our problems here on Earth. We have only been around for 20 seconds on our Earth’s 24-hour timescale, and yet in that 20 seconds we have increasingly put the planet and its ecosystem under a lot of strain. The planet will survive whatever mess we make of it. The question is, will we have the vision and sense to realise that we cannot continue to abuse the environment without serious consequences to the Earth’s habitability ensuing?